Kartell presents world's first furniture made from revolutionary bio-on biomaterial at salone del mobile 2019. "Fully sustainable" edition of modular unit presented at Salone del Mobile already available to buy. Just a few months into the partnership between leading design firm Kartell and Bio-on, listed on the AIM segment of Borsa Italiana and operating in the high quality bioplastic sector, which sees the two companies working together on a number of fronts, the world's first furniture made from BIO-ON's 100% natural, revolutionary bioplastic will be presented at the sector's top international trade show, SALONE DEL MOBILE.MILANO. MyKAI, the cosmetic product line born from the alliance between Bio-on and Unilver is ready to land on the market. The distribution by UNILEVER of the first products of the line, namely the MyKAI solar products, is starting in these days, they represent the first products in the world to bring the extraordinary environmental value, as well as protection, of the innovative Bio-on technology into the hands of consumers. Minerv Bio Cosmetics, the 100% natural bioplastic microspheres biodegradable in soil and water, are named the year's most innovative biobased product in the cosmetics sector. 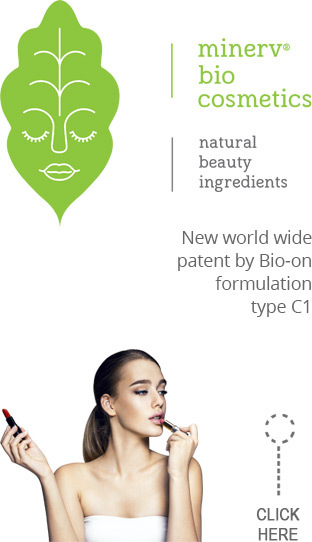 Frost & Sullivan finds that "Bio-On is properly positioned to serve as a leader in the bio-polymeric ingredient revolution for the cosmetics industry". For Frost & Sullivan, the bioplastic microspheres patented by Bio-on are "incredibly versatile" and are "a sustainable alternative to synthetic polymers for use in not only cosmetics, but also in the food, healthcare, packaging, and FMCG industries. Looking ahead, the PHAs could provide a potential solution for cancer treatment within the next few years". Bio-on: i.e., turn on BIO! "turn OFF pollution"! This is the simple idea encapsulated by the ON in our company name; a globally-recognised sign of positivity and of improving the lives of all. From today, Bio-on will help build a more sustainable future for everyone, through everyday plastic objects. By licensing out the proprietary know-how to produce PHAs (polyhydroxyalkanoates), recognised as the best biopolymers for the future. A new generation of linear polyesters to replace and improve PET, PE, PP, HDPE, LDPE... for a world where it is no longer necessary to destroy in order to build, but plant seeds in order to produce. MINERV-PHA™ accentuates its excellent biodegradability factor both in water and in soil. This type of polymer biodegradation is the "future" of global biodegradability. 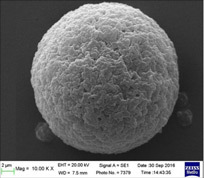 The natural dissolution of a biopolymer in water or soil in a short time is a rare and very difficult result to achieve. MINERV-PHA™ is the first high-performing biopolymer obtained from agricultural co-products or waste to achieve this important result. MINERV-PHA™ dissolves in normal river or sea water leaving no residue in just a few days. MINERV-PHA™ production in its special applications is supplied directly by Bio-on from its production sites. Our industrial production website provides more information.